The boys have watched many things, over and over again. 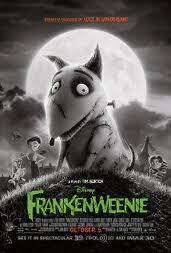 One of them is Tim Burton’s 2012 animation, Frankenweenie. 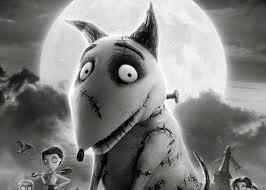 In true Tim Burton form, Frankenweenie is the charmingly, weird tale of how Victor’s beloved pet dog Sparky, is accidentally run over one day. Victor brings Sparky back to life using what he learned during a science experiment in school. But not without disastrous and monstrous consequences. 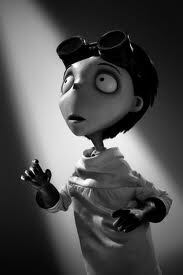 The film features the voice talents of Charlie Tahan who plays Victor. One of my favourite actresses from teenager hood is Winona Ryder and she lends her dulcet tones to the character Elsa van Helsing. And of course Sparky as well, Sparky. The following is Oldest Boy’s (7 years) review of the film. What’s it about? Victor’s dog gets hit by a car and he tries to bring him back to life by giving him electric shocks. His friend finds out and steals his idea and they go to the pet cemetery. They take back their animals and bring them back to life too. But it doesn’t work. Was it scary? A little. 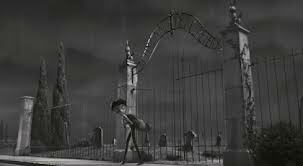 The ending was scary because they went back to the cemetery. What was your favourite part? When Victor’s friend Edgar gets a dead goldfish and tells Victor to bring him back to life. I like this because they made the fish invisible and it didn’t turn out the same as Sparky the dog. Did you like it? Yes! Would people like to watch it? Yes. Did it make you angry, sad, scared, worried, laugh, cry or happy? Angry when the bat took Sparky. It was sad when Sparky died. I got a fright when the rat jumped up really fast. I wasn’t worried because Iarla told me everything that was going to happen. It wasn’t a funny kind of movie. No! I didn’t cry! The ending was happy when they got Sparky back again. 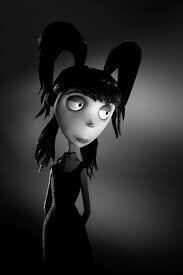 My absolute favourite bit is the song Strange Love by Karen O when the credits are rolling.